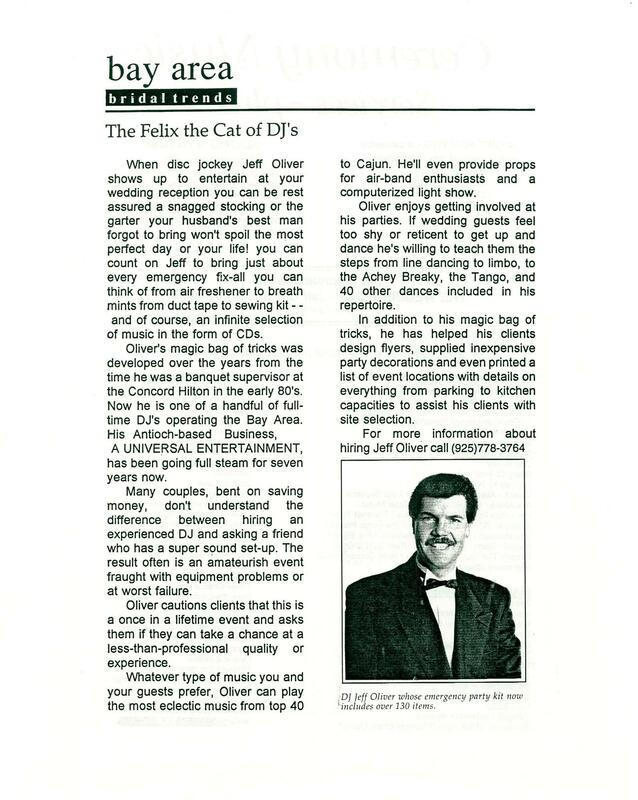 "The Felix the Cat of the DJ's"
When disc jockey Jeff Oliver shows up to entertain at your wedding reception you can be rest assured a snagged stocking or the garter your husbands best man forgot to bring won't spoil the most perfect day or your life! You can count on Jeff to bring just about every emergency fix-all you can think of from air freshener to breath mints from duct tape to sewing kit - - and of course, an infinite selection of music in the form of CD's. Oliver's magic bag of tricks was developed over the year s from the time he was a banquet supervisor at the Concord Hilton Hotel in the early 80's. Now he is one of the handful of full-time DJ's operating in the Bay Area. His Antioch-based business has been going full steam since 1986. Many couples, bent on saving money, don't understand how to hire a professional & experienced DJ. They are fooled by lots by advertising claims and "Bargain Prices". The result often is an amateurish event fraught with problems or as worst failure, "their guests leave before the party is scheduled end". Oliver cautions clients that this is a once in a life time event and asks them if they can take a chance at less-than-professional quality or experience. Whatever type of music you and your guests prefer, Oliver can play the most eclectic music from top 40 to Cajun. He'll even provide stage-props, teach dance lessons and a computerized light show. Oliver enjoys getting involved at his parties. If wedding guests feel too shy or reticent to get up and dance he's willing to teach them the steps from Limbo to the Achey Breaky, from Ballroom to Hip Hop. Jeff teaches 14 dances included in his repertoire. In addition to his magic bag of tricks, he has helped his clients design flyers, supplied inexpensive party decorations and even printed a list of event locations with details on everything from parking to kitchen capacities to assist his clients with site selection. without Authorization from Jeff Oliver.